This Low-Carb Balsamic and Onion Pot Roast uses all my tricks for making pot roast in the slow cooker, and this recipe is an absolute winner! 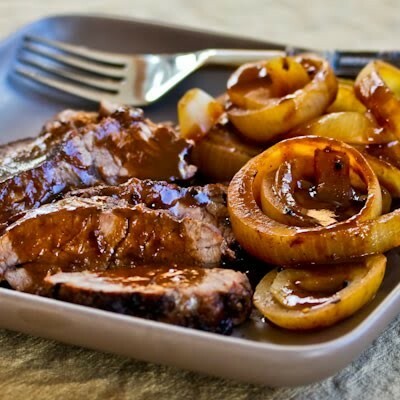 For Friday Favorites we spotlight past recipes that you may have missed, and this Low-Carb Balsamic and Onion Pot Roast from Kalyn’s Kitchen is something I have been enjoying for years! And this pot roast recipe shares the techniques I think are essential for getting good results when you make pot roast in the slow cooker. I know there are lots of variations for slow cooker pot roast, but this recipe for Low-Carb Balsamic and Onion Pot Roast has been one of the most popular recipes on Kalyn’s Kitchen for quite a few years; hope you enjoy trying it! Get the complete recipe for Low-Carb Balsamic and Onion Pot Roast from Kalyn’s Kitchen. Use the Index Page for Kalyn’s Kitchen to see all the slow cooker recipes from Kalyn’s Kitchen that have been featured on this site. OMG! Can't WAIT to make this! It is truly so good, hope you guys enjoy it! 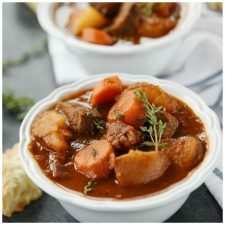 I'm a huge slow cooker fan and this recipe looks perfect. Can hardly wait to try it. Thanks Cheryl, hope you like it! On Google Reader all I saw of the title was "Slow-Cooker Instructions for Making Pot"
That is funny! At least it inspired you to click through! OH. MY. – this looks incredible. I would buy a slow cooker for this – but I think I will try it in my Römertopf! Thanks Meeta, now I need to google to see what a Romertopf is! This is the BEST crock pot meal I've ever made/eaten! My family LOVES it!! Do you have any more recipes similar to this one? So glad you liked it. I am slowly featuring all my slow cooker recipes on this site, but you can find them on my main blog on the Recipe Index page for Slow Cooker Recipes. There are a lot of good recipes there, including a couple of other variations for pot roast or pork roast. Enjoy!